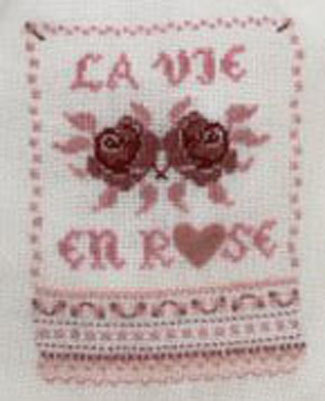 "Life in Pink" is a cross-stitch chart with instructions translated in English. It also exists as a complete kit to make a card or frame. The tiny felt heart is provided with the chart (but you can choose to cross-stitch the heart instead as the pattern is provided). The ready-to-stitch pouch Marie-Louise is available in the "related products" section below. Special stitches: This is a cross-stitch design with some Smyrna cross-stitches and some straight stitches. There are very clear drawings on the chart. This pattern shows 4 colours (DMC references on the chart). The model on the picture has been stitched on the "Marie-Rose" pouch, a ready-to-stitch item by Au Chat qui Dort, using one strand of cotton over one strand of linen. But you can stitch it on the fabric of your choice using two strands of cotton over two thread of fabric. Recommended Fabric: of your choice regarding the type (linen / evenweave) and the stitch count, colour "white" or "off-white", 30x35 cm (12x14 in). This product is a cross-stitch chart + instructions translated in English + small felt heart.